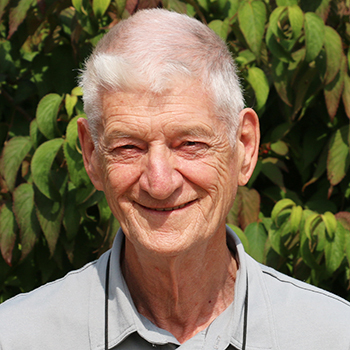 Ron Robert may be a first-year political science student at Laurier, but the 80-year-old could certainly teach a class about practical politics. During a 20-year career as a radio and television journalist, Robert covered three provincial legislatures and the House of Commons. He worked alongside Ralph Klein in Calgary before “King Ralph” became the longtime premier of Alberta, and he got to know many other prominent politicians, including Quebec’s René Levesque, Alberta’s Peter Lougheed and Nova Scotia’s Robert Stanfield, who later became leader of the federal Progressive Conservative Party. Robert even briefly worked with Tommy Douglas, the former premier of Saskatchewan who became the first leader of the federal NDP. Later, Robert headed up the "western desk" in the office of then prime minister Pierre Trudeau. His job was to identify the issues that mattered in Canada's prairie provinces and ensure that the prime minister was kept abreast of critical information related to Western Canada. A proud member of the Métis community, Robert went on to co-found the Canadian Aboriginal Festival and the Canadian Aboriginal Music Awards. He also worked with the Historica Foundation of Canada, now Historica Canada, an organization that encourages Canadians to take an interest in their history. Despite his impressive resumé and long list of accomplishments, Robert never earned a university degree. He's working to change that. "I've been learning since Day 1 that I arrived here," says Robert, who is enrolled in two first-year Laurier courses and working toward a bachelor of arts degree. "What's really interesting is when we get into classroom discussions and I listen to what young people have to say. I find the young people compared to me at the same age much smarter and more articulate. I think back to when I was that age and I wouldn't have been able to hold a candle to any of them." Five years ago, Robert was diagnosed with Alzheimer's disease. His battle against the disease is one of the main reasons he decided to pursue post-secondary studies. "As soon as I was diagnosed, I started learning languages – Spanish and French – but found that wasn't enough," Robert says. "I thought, 'I have to do something more.' I always wanted to go to university and get a degree. So I am here at Laurier for two reasons: it's on my bucket list and to keep Alzheimer's at bay." In addition to his studies, Robert is working with the Alzheimer Society, speaking to those living with the disease about his experience. Born in Halifax, Robert began his career in the news media at the age of 16, not even having graduated from high school. He was living in Saskatoon at the time and his girlfriend's father arranged an interview for him at radio station CFQC Saskatoon. He started work the next day. Robert went on to spend two decades covering provincial legislatures in British Columbia, Alberta and Saskatchewan, as well as the House of Commons in Ottawa. While working in the nation's capital, he filed radio and television reports that aired in western Canada. "I used to interview the prime minister of the day about twice a year," Robert says. "Every time Pierre Trudeau and I sat down, I would mention that I felt he was preoccupied with Quebec, further alienating the West. That was somewhat understandable because it was just after that time the FLQ rose to prominence." Robert's discussions with Trudeau must have left an impression. In 1974, he was offered a job in the Prime Minister's Office and left his journalism career behind. "I got a call asking me to put my money where my mouth is," Robert says. "They needed somebody to head up the western desk and asked if I was interested. Of course I was interested. I was over there in a shot." "My job was to find out what the issues were and dig into those issues. I would meet with people and then write briefing notes. When the prime minister had meetings out west I would travel with him and help facilitate the meetings. The one trip that stands out in my memory was our trip to Washington, when I had the privilege of meeting President Gerald Ford." Robert recalls that the former prime minister, known for his brash and flamboyant style, also had a shy side and could be very kind. That kindness was on display just prior to the 1975 Grey Cup in Calgary. While discussing the prime minister’s plans to attend the game, Robert mentioned that his father, an avid sports fan, had never been to a Grey Cup because he couldn't afford to go. "The prime minister said, 'What do you mean your dad hasn't been to a Grey Cup game? Invite him.' So I invited my dad." During a reception before the game, Robert was talking with a group of dignitaries that included the prime minister. Trudeau suddenly stepped away from the group. "When I turned around there was the prime minister sitting with my dad, just chitchatting," Robert says. "Whether he did that for my dad's sake or to annoy the other politicians, I don't know. But my father went to his grave thinking that was one of the best things that ever happened to him." Robert worked in the Prime Minister's Office until 1977, when a reorganization ended the regional desk system. He later took a position as a senior communications officer in the federal government, where he remained for 10 years. Following his time in journalism and politics, Robert shifted his focus to an issue he and his wife Catherine, a member of the Oneida First Nation, care deeply about: the well-being of Indigenous communities. Robert started a consulting company that worked with the Chiefs of Ontario on a study about how the organization of Indigenous leaders could best offer support to the province's First Nations arts and crafts community. The study led to a series of recommendations outlining ways aboriginal arts and crafts might be sold directly by those who created them. The Chiefs of Ontario later asked Robert to implement the recommendations, which led to the foundation of the Canadian Aboriginal Festival and Canadian Aboriginal Music Awards. Initially, the event was held at the Canadian National Exhibition, but later evolved into an indoor event at Toronto's SkyDome, now the Rogers Centre, where it was held annually for 18 years. Thousands of students and members of the general public attended each year to learn about Indigenous culture through music, dance, storytelling and exhibits. Robert says his work in helping to launch the Canadian Aboriginal Festival and Canadian Aboriginal Music Awards is a source of great pride. "We helped a lot of people in the arts and crafts community over the course of 18 years," he says. Robert later became a council member for the Historica Foundation of Canada. As a member of the council, he advised his fellow council members about how Indigenous history should be reflected through the organization's Heritage Minutes television segments, as well as formal classroom curriculum. Since enrolling at Laurier in September, Robert says he has found great support from faculty members, fellow students and university employees. "I'm really enjoying it here and I enjoy being around so many young people," he says. "And I don't think I've ever run into a better group of staff people than at Laurier. They're just amazing and it's a wonderful community. The people here are just great." As he moves forward in his academic career, Robert hopes to talk with Laurier students about one of his favourite topics: morals and ethics in politics. He also says his time at Laurier has provided some new ideas about improving how politics is practiced in Canada. "You know what I'd like to do?" Robert says. "I'd like to drag some of our politicians here and have them sit down with these young people. Because in the short time I've been here, I've realized that all of the time I was involved in politics I really didn't grasp the perspective of young people. Too many decisions are made short-term or on a populist basis, which is never a good way to make a decision. If we would have listened to young people more when I was in politics, we would have had a whole different idea of what Canada was all about – and how to make it better."